36% of companies reported below-expectation results in 3Q18, which is one of the highest proportions since 2Q16. Post the results, we have reduced market EPS growth further. Consensus have also cut 2018 estimates by 2.7ppt. 3Q18: More misses than hits. 36% of the companies within our coverage missed estimates. This is one of the highest levels of disappointments since 2Q16 when 37% of results were below expectations. Only 17% of the companies reported better-than-expected results, which compares with 29% beats in 2Q18. With the exception of banks, most of the other sectors actually missed expectations. Notable misses include Venture, SingPost and Singtel. Conversely, Japfa was a notable outperformer in its latest results. Continued cut in market EPS to reflect weaker outlook. After a relatively disappointing 3Q18 results season, our earnings forecasts have moderated due to concerns over weaker growth ahead as markets grapple with external issues such as the fallout from the trade war, rising interest rates and volatile currencies, especially for emerging markets. We now expect market EPS to grow 6.2% y-o-y in 2018 (previously 6.6%) and 5.0% y-o-y in 2019 (previously 6.5% y-o-y). The reduction in 2019 is primarily due to banks and telecommunications. Banks: Delivering in 3Q18 amidst volatile environment. All three Singapore banks met our expectations. DBS and OCBC achieved NIM expansion and strong growth in net trading income. OCBC’s CET-1 CAR improved substantially by 0.4ppt q-o-q to 13.7% and has caught up with that of its peers, and we see possible upside in OCBC’s dividend payout. Asset quality was largely stable and DBS’ and OCBC’s NPL ratios were unchanged at 1.56% and 1.58% respectively. 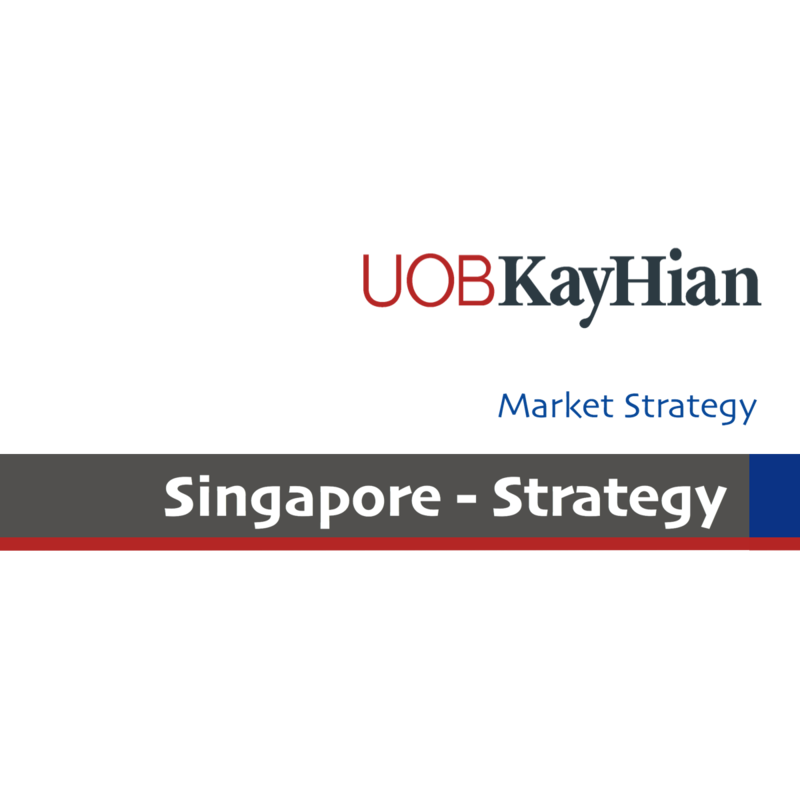 We prefer OCBC due to its potential to catch up in NIM expansion and dividend payout. Valuation wise, OCBC is also attractive, trading at more than 1SD below its long-term mean P/B. ST Engineering’s 3Q18 was slightly below expectations due to losses at its US subsidiary VT Miltope, but we remain optimistic on its longer-term prospects, particularly after its acquisition of MRAS, which should provide earnings visibility. SATS was marginally below expectations, but the street was disappointed due to weaker associate contributions and higher concession fees at PT CAS. SIA was the only bright spot as core earnings was S$47m better than our expectations. While we are slightly disappointed with the 2% decline in pax yields, we are encouraged by SIA's optimism on cargo outlook for the near term. We also believe that SIA will continue to benefit from lower fuel prices, and margins could improve in 3QFY19. We recommend accumulating SIA at S$9.20-9.30. Telecommunications: Misses all the way. Both Singtel and StarHub missed expectations. In the case of Singtel, the miss was due to a combination of losses from Bharti (S$176m) as well as the depreciation of the Australian dollar, Indonesian rupiah and Indian rupee against the Singapore dollar. As for StarHub, net profit was dragged by a one-off adjustment to traffic expenses of S$5m. The group’s mobile business will be impacted by intense competition whereas its pay-TV is facing a secular decline. Nevertheless, its fixed enterprise is growing well and management’s operational efficiency programme will start to bear fruit in 1Q19. We have BUYs on both StarHub and Singtel but the former is our top sector pick. Property: Developers and S-REITs largely in line. CapitaLand’s and City Developments’ 3Q18 results were in line. City Dev’s strong showing in 9M18 was underpinned by strong development profits from several projects including New Futura, Park Court Aoyama The Tower and The Criterion EC. Hotel operations declined in 3Q18 due to closures for Millennium Hotel London for refurbishment work and its Maldives Resort for a rebranding exercise. CapitaLand’s 9M18 results were in line, helped by contributions from newly acquired and opened investment properties in Singapore, China and Germany. The group remains on track to meet is AUM target of S$100b by 2020 as its AUM currently stands at S$92.8b. CapitaLand is our preferred developer. Within the S-REIT space, notable results include CMT and CD REIT. The former outperformed our estimates, mainly due to higher-than-expected contributions from Bugis Junction and Atrium@Orchard. On the other hand, CD REIT was below as its Singapore portfolio was dragged by renovations at Orchard Hotel and price competition from new hotel incumbents. Japan and Germany properties saw a stronger quarter, aided by local regulations on AirBnB and a stronger calendar of events. Australia, New Zealand and the UK saw weaker contributions on weaker currencies and calendar of events. Shipyards: Mixed bag; Yangzijiang shines, SMM and SCI in line. The sector had a mixed performance in 3Q18. Yangzijiang was the star as 9M18 results exceeded our and consensus expectations due to a combination of better-than-expected shipbuilding core margin (20%), higher revenue from shipbuilding trading revenue and its investment segment. Sembcorp Marine and Sembcorp Industries both reported in-line results. For Sembcorp Industries, its utilities segment performed well with better-than-expected performances in Singapore, China and the UK. India was profitable, helped by write-backs at SGI, but SGPL posted larger losses. There was no update on its India IPO with management giving feedback that market conditions are not right. Sembcorp Industries remains our top pick as we had downgraded Yangzijiang after its stellar 3Q18 results and share price bounce. Notable results – Venture and Japfa. Venture disappointed us and consensus as its 3Q18 net profit of S$81m fell 27% y-o-y and 17% q-o-q. Revenue fell on the back of order delays and new product launches. In our view, the decline in revenue was primarily due to IQOS’ production cuts. Consequently, we have downgraded Venture to SELL. We raise our 2018-20 core net profit forecasts by 6.6- 7.1% and re-iterate BUY with a higher SOTP-based target price of S$0.98. End-19 FSSTI target of 3,450. We believe investors should selectively accumulate on pull-backs. In the large-cap space, we like OCBC, DBS, CapitaLand, CCT, Ascendas REIT, Singtel, SATS and ST Engineering. Mid-cap gems include CSE and Japfa. SELL Golden Agri-Resources and Venture.